JOHOR Corp, the investment arm of the Johor state government, has another 2,000ha to be developed in the Iskandar Malaysia region, said chief executive officer Tan Sri Muhammad Ali Hashim. "The landbank is there for future development of industries in the growth region," he said in an interview with Business Times in Bangi, Selangor, yesterday. While the newer part of the growth corridor located in the west of the state, namely in the Tanjung Pelepas and Nusajaya areas have attracted strong interest, Pasir Gudang and the Tanjung Langsat Port in the east, are equally vibrant. "With good infrastructure, power, electricity and gas readily available, industries can look to setting up operations here, while the new bridge linking to Desaru provides good connectivity." The Tanjung Langsat Port, run by a subsidiary of JCorp, is almost ready and it will be the new oil and gas hub. 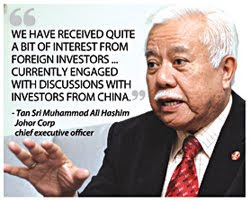 It has already attracted RM4 billion in foreign investments from France, Korea, Spain and Germany. These include Erndtebrucker Eisenwerk GmbH & Co KG, the German heavyweight steel pipe manufacturer and Bahru Stainless Sdn Bhd, which is 67 per cent owned by Spanish company Acerinox, and 33 per cent by Japan's Nisshin Steel. "We have received quite a bit of interest from foreign investors and we are now currently engaged with discussions with investors from China." The oil and gas hub has also attracted keen interest from Singapore-based small- and medium-sized enterprises. It was reported last month that Johor has secured more than RM50 billion in new foreign direct investments in the oil and gas sector. "We'll attract capital-intensive investments that the government is pursuing, which provides a good chance of reducing dependence on foreign workers and, at the same time, providing quality jobs with higher income for Malaysians." JCorp spent RM1 billion in constructing an industrial complex in Tanjung Langsat. Across Johor, the investment arm has 40,000ha planted with oil palm trees, some of which have the potential for property and industrial development. Muhammad Ali said JCorp is also positioning Tanjung Langsat as the regional hub for the biofuel industry. Henry Butcher Malaysia (Seberang Perai) Sdn Bhd's senior manager Fook Tone Huat said that development land, especially in Seberang Perai, is still in good demand, particularly those near town areas. "Although many projects were deferred last year, we are confident that the worst is over and and the public confidence has begun to come back in the property market," he said at a media briefing on the property market in Seberang Perai, Butterworth, yesterday. The Seberang Perai area is expect to record a 10 per cent rise in appreciation rate due to its high population density compared to neighbouring states like Kedah and Perak, Fook said. Fook said that development land in Seberang Perai is two times larger than those in Penang island. According to Fook, now is the time for the public to purchase properties as the base lending rate is still below six per cent. A green concept: I-Berhad deputy executive chairman Datuk Lim Kim Hong (left) briefing Chin (middle) on the concept while I-Berhad CEO Eu Hong Chew looks on. The developer of i-City, I-Berhad will be introducing a number of ideas that will pave the way for the knowledge and tourism hub to be a green development. In opting to be a “green development”, the developer will be introducing a number of innovative ideas. environmental-friendly ecosystem, with a campus setting comprising a central park with fingers of green running throughout. These includes using architectural designs in buildings to create a north-south orientation that funnels the wind flow as well as to use the buildings’ shadows as shade and LED lights, which are 68% lower in carbon footprint than conventional bulbs, in the design of the “lightscape” digital display. As part of its commitment to help reduce the carbon footprint, i-City organised the Earth Hour in 2009 to create an awareness of the need to highlight the issue of global warming. Minister of Energy Technology and Water Datuk Seri Peter Chin Fah Kui who was present at the briefing on the latest ideas had nothing but praises for the concept. 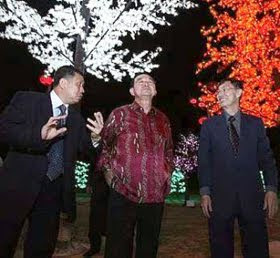 “I would like to congratulate i-City for all these initiatives,’ said Chin. PETALING JAYA: Malton Bhd, via wholly-owned subsidiary Pioneer Haven Sdn Bhd (PHSB), has entered into a joint development agreement with Bukit Jalil Development Sdn Bhd (BJDSB) for the development of freehold land in Bukit Jalil worth RM2.5bil. In a note to Bursa Malaysia yesterday, Malton said the project would be completed in phases over 10 years from the approval date of the development, with an automatic extension of five years, subject to market supply and demand conditions. Malton said the joint venture was in line within the expansion plan of its core business activities of property development, construction and property investment. It said the joint venture was expected to contribute to the medium and long term profitability of the company. PHSB and BJDSB will have an 83% and 17% entitlement of the GDV respectively. In a separate statement, Malton said it had acquired the remaining 49% of the issued and paid-up share capital of PHSB for RM49 cash on Tuesday. PROPERTY developers will be able to share ideas and discuss industry issues at the third National Real Estate Property conference to be held next month. The Malaysian Islamic Chamber Of Commerce will hold the event at the Putra World Trade Centre in Kuala Lumpur on April 7 and 8. "It will be an ideal platform for those in the industry, large- and small-sized business enterprises to discuss the current challenges with the heightened competition. "It can also bridge the gap between industry players and academicians ," deputy president Tan Sri Muhammad Ali Hashim said at a media briefing in Bandar Baru Bangi, Selangor, yesterday. Muhammad Ali, who is also the chief executive of Johor Corp, will present a paper on the need to put unused wakaf land to good "commercial use". "In many parts of the country, these unused plots of land also look unsightly when sited next to major properties." PETALING JAYA: The Templeton Emerging Markets Group of Franklin Templeton Investments has acquired a 5% stake in property developer KSL Holdings Bhd. The 5% stake half of the 10% stake or 35.1 million new shares placed out by KSL. The private placement was completed following the listing of the new shares on March 12. Templeton executive chairman Mark Mobius was quoted in a Bloomberg report as saying that he was impressed with KSL’s diversified property project and business model. “Our investment will provide support for the company’s continued growth and presence in the fast-growing Malaysian market,” he said. KSL executive director Ku Tien Sek said he “felt good” about the acquisition by Templeton. “They like our management style,” he said when contacted by StarBiz. Ku said the remaining 5% was acquired by a mix of local and foreign fund managers. He also said KSL would be launching its maiden project in Klang within the next three months. “It is a mixed residential township and will have a gross development value worth RM2.5bil. We have a 450-acre plot next to Bukit Tinggi 3 in Klang,” he said, adding that the company had not come up with a name for the project. Ku said KSL currently had four projects in Johor. MAGNA Prima Bhd’s planned purchase of two pieces of land in Kuala Lumpur for some RM58 million from Muafakat Baru Sdn Bhd is now extended by a further three months to June 19 2010. Magna wants to build a shopping mall and two blocks of serviced apartments worth some RM730 million on the 4.1ha. The land is located next to Jalan Kuching and the intersection between Jalan Kuching, Jalan Ipoh and Jalan Kepong. The deal was first announced in November 2007.